As example 24 explains, the TEditLink provide the capability to use any type of inplace editor with TAdvStringGrid. In this example, a TImagePicker control is combined with a TAdvStringGrid data-image. A data image is an image that reflects a cell value. The image picker is then used to select this. 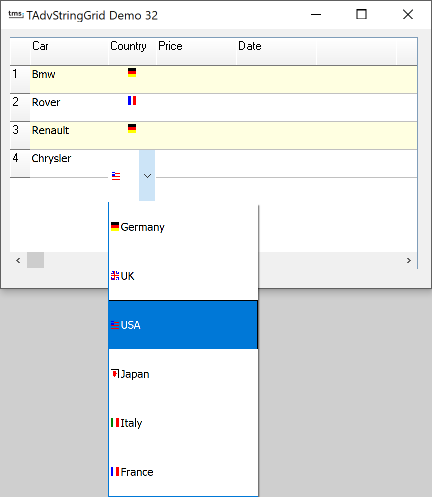 In the example, a country is represented by a number which is in turn represented by an imagelist element. The first step to set the grid's images is simple. Set the EnableGraphics property to true, assign an imagelist to the Grid.GridImages property and call Grid.AddDataImage(Col,Row,Idx,Horiz. Align, Vert. Align). selects image 2 from the imagelist. This is all it takes to use the TImagePicker component as inplace editor for TAdvStringGrid and descendant components.